If the idea of working jointly on a project or activity incites hellish flashbacks of uni group projects, stick with me. Collaboration is not a dirty word. Done right, it can open up some pretty awesome opportunities, bring new people and ideas into your world and play an integral part in the future success of your business. Whether you’re a product or service-based business, you can form connections with others, and grow your business by investing in and collaborating with these connections. One of the best things about running my own business is the opportunity to collaborate with other people. I may work for myself, but that doesn’t mean I don’t miss interaction in the workplace. So, now I simply create it. Through collaborating with others, I can experience a feeling of connectedness. Starting out in a brand new industry in my mid 30s, I found myself totally out of the networks and loops that I had built up over 12 years in the education sector. My career had changed, but so too had the nature of networking. Here’s why you should consider collaboration for your small business. It’s easy to get stuck doing things a particular way. Need a new perspective? Online tools and blogs can inspire you, sure, but try human connection for the ability to discuss, share and communicate inspiration and information. Who knows? You may end up with a fresh technique, tool or new content idea. Someone to bounce ideas off can trigger creativity, and also provide an objective point of view. Nothing terrified me more than networking when I started working for myself. Going along to my first networking event felt like a torturous first day at school. Each time I approach new people, my stomach does a little flip, but I do it anyway. I didn’t leave my last career with a huge list of contacts or clients. I’ve built them up from scratch. And I truly believe in the power of human connection. So, if I don’t continue to put myself out there, chatting about why I believe in my business, how can I expect it to grow? An added bonus, of course, is that I’ve met such wonderful people whose services and products I can access. The reality of being in business is that you need to consistently make connections, to encourage referrals and new work. Every time you reach out to someone, you are expanding your network, whether or not it results in collaboration. I don’t know about you, but the older I get, the more I’m driven by a desire for lifelong learning. I actually hanker for it. While sometimes the breadth of what I don’t know seems overwhelming, it’s also very motivational. Collaboration brings with it the opportunity to learn from someone with a different skill set, strengths and perspective. There is definitely power in numbers, in terms of accomplishing something or solving a problem. Creative Darebin Networking Breakfasts - a weekly breakfast for creatives in my hood ticks all the boxes. Casual conversation over coffee with like-minded types? Yes, please. She Will Shine Women’s Business Network - a totally unstuffy, supportive and inspiring girl gang offering networking nights, power groups, dinners and the rest! 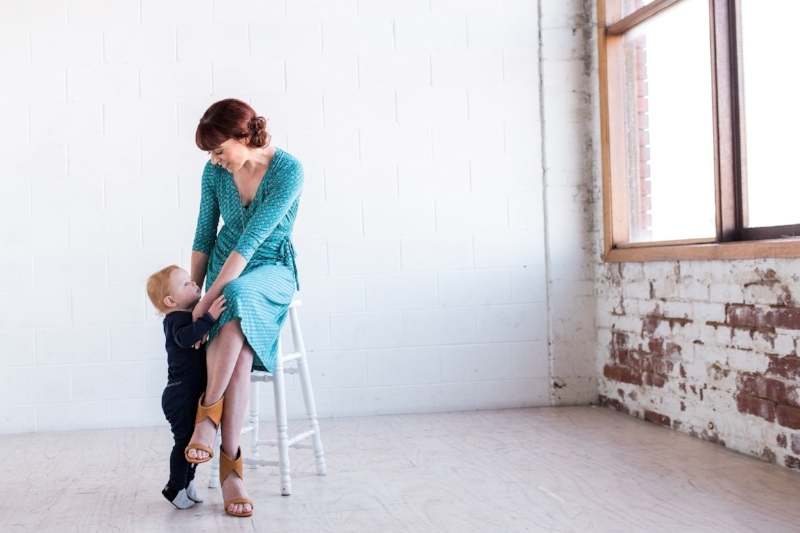 Hood Mama Edit - a slick photo shoot collaboration masterminded by Holly at Motherhood Melbourne and shot by legend behind the lens, Jess Worrall. Guest blogs on other sites (psst...did you catch me on Seriously Milestones last night?) and interviews with people I admire, like my chat with author Emily Brewin. Opportunities that have come my way only because I had the courage to reach out. I’ve had some of my freelance articles published and generated new copywriting work this way. So, what should I consider first? Before you reach out, think carefully about who to partner with and why. Do your goals and values align? Do you have the same target audience? What can you each bring to the table? How will the collaboration idea work? On a practical level, you can use your combined leverage to connect with more people and spread your message. Social media campaigns don’t need heaps of money or followers, but they do need a genuinely engaged following to be successful. Other ideas are to feature one another, such as by guest blogging or promoting each other’s services. Photo shoots can work too. For the Hood Mama Edit, bloggers and writers wore the products supplied, then created content. Don’t be afraid to collaborate with your ‘so-called’ competitors either. There’s power in numbers, and clearly common interests. The question may be, why wouldn’t you? I’d encourage you to begin online, via Facebook groups or networking sites. I love connecting with fellow freelancers and copywriters this way. Search your local area for IRL networking options too, or chat to your friends. They may know someone they can put you in touch with. You don’t need to meet in person if that’s too tricky. There’s always Skype for chats, Google Drive for doc sharing and Trello for project management. Keep it easy! Just enjoy the process. What collaborations have you been a part of? Let me know. Or if you've got a great idea about how we could work together, let's chat!